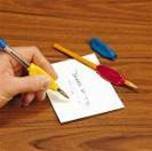 Our Writing Aids range is comprised by many different categories and types. Below is just a sample of a few items from our Writing Aids range that makes your everyday life easier. For the complete collection please contact us. Dexball is a unique writing aid that gives anyone with a grip or wrist problem the ability to write accurately at a desired angle. Manufactured from high density foam, Dexball uses an innovative method to hold the pen or pencil securely in position. The T-Bar Brush Holder provides leverage and added stability for an art brush. These innovative art tools provide adaptive holding methods to paint with ease. The Universal Art Tool Holder (cuff) fits right or left hand, and holds the art brush in palmar pocket using the plastic 'L' attachment. It's made of soft nylon neoplush and has a Velcro closure. 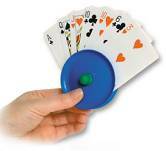 These helpful holders have plastic vinyl contoured handles for improved grasp and control. They securely hold most round or irregularly shaped items by means of three adjustable set screws. Takes most of the tremor and muscle pain out of handling a pen. One finger goes through the ring creating a solid grip and the ergonomically designed barrel provides a natural resting place for the writing finger. The barrel fits snugly between two other fingers so there is no pressure or pain. Can also be used as a toe pen. Extra-soft, pliable surface makes it even easier to hold this PenAgain writing instrument. Perfect for patients with limited grasp. 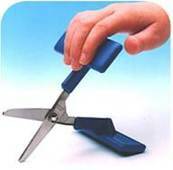 This device has scissors mounted on a plastic base, with rubber non-slip feet. The scissors are operated by depressing the 'T' shaped handle and the spring will automatically reopen the blades once the pressure is released. Suitable for use by those with only one functional hand. Self-Opening Scissors look like conventional style scissors but have been fitted with a spring so that they automatically reopen after pressure is released. They are supplied with a blade guard and are available in either left handed (or right handed styles. Blades are round ended, stainless steel. - Spring fitted to automatically reopen the scissors after pressure has been released. No other similar product combines so much that helps people - children and adults alike - who are affected by visual stress.